On April 25, Marquette University Law School announced the creation of the Lubar Center for Public Policy Research and Civic Education. The center will be supported by a gift of $5.5 million from Sheldon and Marianne Lubar. The Lubar Center will further extend the Law School’s extensive engagement in public policy research and civic education, providing long-term support for an expanded set of initiatives. This gift builds on a previous seven-figure gift from the Lubars, in 2010, which established the Lubar Fund for Public Policy Research. The Law School’s “public policy initiative,” established more than a decade ago, covers a wide range of activities including speakers, polling, fellowships, research, debates, and conferences. Perhaps the best way to imagine the new role of the Lubar Center is to appreciate the range of activities in which the Law School’s public policy initiative has engaged in recent years. These previous efforts, including support for reporting projects and civic education events, have established Eckstein Hall as “Milwaukee’s public square,” in the words of the Milwaukee Journal Sentinel. If past is prologue, this review also provides a preview of what the new Lubar Center can hope to accomplish. To begin: The lunchtime interview series, “On the Issues with Mike Gousha,” has brought some 200 speakers to Milwaukee for interviews with Gousha, who is the Law School’s Distinguished Fellow in Law and Public Policy. The topics have ranged from regional water issues to crime to economic development to the Holocaust to international security to sports. These sessions, which fill the 200-plus seat first-floor room (now known as the Lubar Center) at Ray and Eckstein Hall, feature a wide array of perspectives on law (e.g., Supreme Court Justice Elena Kagan, former Solicitor General Paul Clement), members of Congress (Senators Ron Johnson and Tammy Baldwin, Speaker Paul Ryan, Reps. Mark Pocan, Reid Ribble, Ron Kind), virtually every candidate for statewide office, Pulitzer Prize winners, business leaders, historians, and many more. Eckstein Hall has hosted numerous debates, moderated by Gousha and broadcast statewide, between candidates for virtually every statewide office, including races for governor, U.S. Senate, the Wisconsin Supreme Court, and state attorney general. The existing Lubar Fund, which will become part of the Lubar Center, has supported journalism fellowships for major reporting projects in conjunction with the Milwaukee Journal Sentinel over the past five years, on topics such as political polarization, extensive reporting on the new Milwaukee Bucks arena, the economic history and current prospects of Milwaukee, and most recently a series on the impact of childhood trauma on poverty in the city. Each of these has illuminated the health, both good and bad, of the Milwaukee area and of the state. Recent partnerships with the Milwaukee Business Journal have resulted in multi-article series on Milwaukee’s General Mitchell airport and on the future of workforce development, also supported by the Lubar Fund. Alan Borsuk, Senior Fellow in Law and Public Policy, has helped make education a continuing focus of the public policy initiative. Events have included individual speakers from across the spectrum of education issues. Education is a contentious issue with passionate advocates on all sides, but a hallmark of public policy events at Eckstein Hall has been the ability to host civil and serious conversations across conflicting viewpoints. Recently, for example, Borsuk moderated a discussion between an advocate of private school vouchers and an advocate for increased public school funding. More-expansive conferences, involving Borsuk, Gousha, and others, have addressed issues of charter schools and Catholic K-12 education. Most recently, the Law School and Marquette’s College of Education hosted a debate, moderated by Borsuk, between the candidates for state school superintendent. Since January 2012, the public policy initiative has included the Marquette Law School Poll, the most extensive survey of public opinion in Wisconsin. While law school events bring a wide range of speakers, the poll was conceived as a way to give voice to the public at large. Representative samples of the public demonstrate the wide range of views on policy issues and how these views differ across the political and geographic regions of the state. The results of each poll are presented by Gousha and Charles Franklin, poll director and professor of law and public policy. In 2012 and again in 2015, the policy initiative, in partnership with the Milwaukee Journal Sentinel and with the support of the Lubar Fund, hosted conferences on Milwaukee and the “Chicago Megacity.” These conferences brought regional elected officials, business leaders, and academics together to discuss issues of regional cooperation and competition across the three states and hundreds of municipalities that are part of the megalopolis linking northwest Indiana, Chicago, and Milwaukee. In 2015, this included results of the first poll of the entire region, gauging citizens’ views of cross-border cooperation. The Law School has also hosted conferences and events featuring leading scholars working on cities, their problems and prospects. These have encompassed work on neighborhoods by Harvard’s Rob Sampson, intergenerational effects by Patrick Sharkey of New York University, social mobility by Stanford’s Raj Chetty (a Milwaukee native), and, most recently, the impact of eviction in Milwaukee, featuring Harvard’s Matthew Desmond, winner of this year’s Pulitzer Prize for Nonfiction. This prologue, extensive as it is, merely sets the stage for the expanded opportunities offered with the new Lubar Center for Public Policy Research and Civic Education. The Lubar Center will allow us to expand our public policy work to include new efforts focused, for example, on the Milwaukee metropolitan region, as well as issues of statewide importance including water quality, public libraries, the workforce, and the future of rural Wisconsin. 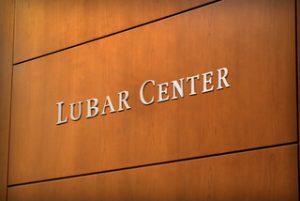 Through an expanded range of civic education events, the Lubar Center will not only produce research on public policy issues but also provide opportunities for public presentation and discussion of that research, bringing community audiences into contact with leading thinkers and researchers on a wide range of issues here at Milwaukee’s public square.